The World Bank has invited Zambia to become one of the pilot locations for the human capital project, an initiative aimed at scaling-up access to quality education, health, and skills development. The move has been welcomed by Minister of Finance Margaret MWANAKATWE and her counterpart Minister of National Development Planning, Alexander CHITEME. The project is targeted at harnessing human capital in order to help children grow to their full potential and become productive assets, in line with the fourth pillar of Zambia’s Seventh National Development Plan. Mrs. Mwanakatwe, Zambia’s delegation leader, thanked the bank for it’s expressed commitment to support the further development of hydro, solar and other sustainable energy sources. “Apart from sales of mukula timber, the land titling programme, and enhancement of other revenue channels, we are targetting energy exports as an alternative revenue source for the medium to long-term,” said Mrs. Mwanakatwe, who also added that, the pursued path is expected to help enhance foreign exchange inflows for the country. The meeting with Mr. Ghanem also touched on matters related to debt management, fiscal reforms, and the recently approved Country Partnership Framework which will be launched in Lusaka in a few weeks time. The other focus areas were the expansion of jobs and opportunities for the rural poor; improvement of public services and social protection for job participation; and, creation of resilient public institutions. Following the meeting with Mr. Ghanem and his team, the Zambian delegation was delighted to earn the assurance of the World Bank for support for women empowerment, agriculture diversification, the digital economy, water resource management, and sanitation programmes. In his concluding remarks, Mr. Ghanem took the opportunity to encourage the Zambian authorities to accelerate the implementation of programs under the Country Partnership Framework, adding that, accerelated resource absorption capacity will be key to the attainment of set goals and targets under the Country Partnership Framework. 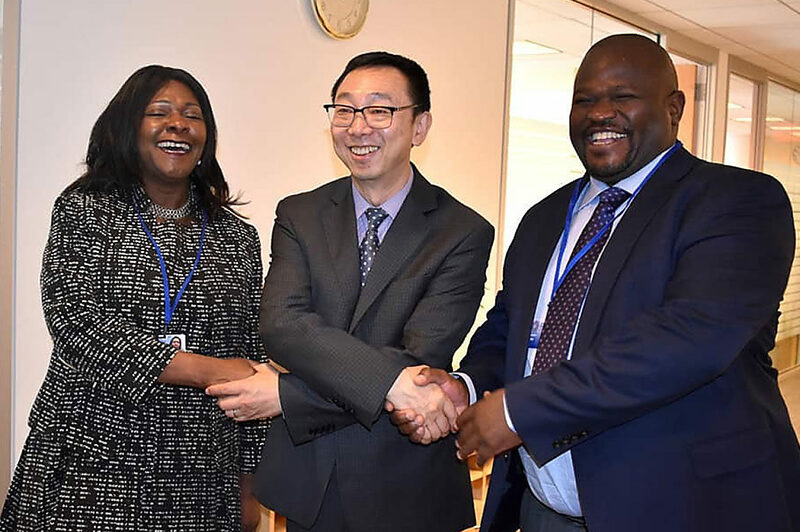 Meanwhile, Mrs. Mwanakatwe and Mr. Chiteme have met the IMF DEPUTY Managing Director TAO ZHANG. The high-level information exchange dialogue with Mr. Tao and his team focussed on the Zambian economy with special emphasis on the macroeconomic landscape, debt management, fiscal consolidation, and the upcoming GRZ/IMF Article 4 Consultations to be held in Lusaka. During the meeting, Mrs Mwanakatwe reiterated the positive macroeconomic forecasts for Zambia including attainment of the set GDP growth and inflation targets of around 4% and 6% to 8%, respectively. Last night, Mrs. Mwanakatwe also attended a dinner hosted by the IMF Managing Director Mrs. Christine Lagarde in honour of a few select Heads of Delegation. Mrs. MWANAKATWE, Mr. CHITEME and the rest of the Zambian delegation are today expected to attend Africa Group One Constituency Meetings of both World Bank and the IMF. The team will also address a business forum for elite investors from America, Asia, Europe, and the Middle-East. 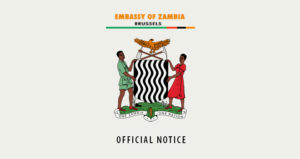 Members of the high-level Zambian delegation include Secretary to the Treasury FREDSON YAMBA, Deputy Secretary to the Cabinet [Finance and Economic Development] CHRISTOPHER MVUNGA, and Bank of Zambia Governor Dr. DENNY KALYALYA. Others are Ministry of Development Planning Permanent Secretary CHOLA CHABALA, Ministry of Finance Permanent Secretary for Economic Management and Finance MUKULI CHIKUBA, Zambia Revenue Authority Commissioner General KINGSLEY CHANDA, and Zambia Integrated Forestry Landscape Project Coordinator, Dr. TASILA BANDA. Upon her arrival on Tuesday, Mrs. Mwanakatwe addressed her delegation and urged the team to be at their best and to represent the country well. I requested all of them to endeavor to send messages that are consistent with the country’s positive ambitions and aspirations aimed at making Zambia a prosperous middle income nation where no one will be left behind. While in Washington, DC, the delegation will attend and participate in events, meetings, seminars and sessions of both the International Monetary Fund [IMF] and the World Bank Group (International Bank for Reconstruction and Development – IBRD, International Development Association – IDA, International Finance Corporation – IFC, and the Multilateral Investment Guarantee Agency – MIGA.